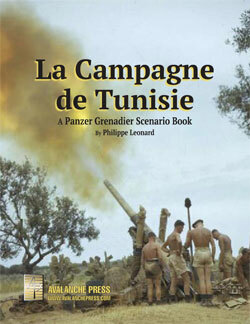 France’s Army of Africa sees action against the Germans and Italians (and, briefly, the Americans too) in Panzer Grenadier: La Campagne de Tunisie, an expansion for An Army at Dawn. The proud regiments struggled to maintain themselves after the June 1940 Armistice with the Germans and Italians. The depots contained little armor, as most tanks present in the North African colonies returned to France to fight on the main front (though as we saw in Part Two, some were hidden away from the Armistice commissioners and others were shipped to the colonies with German permission). 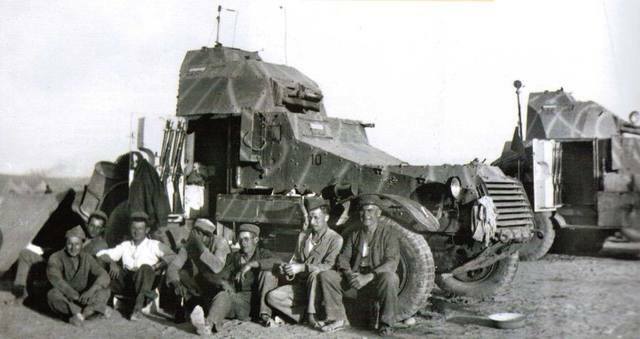 Armored cars also fell under the Armistice provisions, but many of the vehicles remaining in North Africa apparently were simply too crapulent to bother confiscating while others were hidden away. When war broke out, French divisions at the front fielded 219 modern armored cars, with another 163 obsolete vehicles assigned to training or security duties and some 252 older vehicles in the colonies, many of these unserviceable. Some of these aged vehicles were deployed against the Americans in November 1942, and when the Army of Africa switched sides to fight the Axis more of them were brought out of hiding. Eventually these units received South African-made Marmon-Herrington Mark III armored cars, and later the Americans provided much more modern M8 and M20 vehicles. Like most other armies, the French split their ground forces between the infantry and cavalry, and each of these developed their own armored vehicles, formations and doctrine. Armored cars fell under the cavalry, which experimented with wheeled, half-tracked and fully-tracked vehicles – the regulations reserved “tanks” (chars de combat) to the infantry, but did not offer a definition and the French cavalry would soon develop its own tanks, but still deployed armored cars in reconnaissance formations. Armored cars also filled colonial policing duties better than tanks, offering better mobility and easier maintenance while providing the same level of intimidation. The Army of Africa had to go to war with the weaponry it had, not what it wished it had, including the White-Laffly 50 AMD. These consisted of the armored body of the 1918-vintage White TBC armored car, fitted on a new truck chassis with a new 50-horsepower engine. The American manufacturer, White Motor Company, had supplied 230 of them to the French during the Great War. Between 1931 and 1933, the French manufacturer Laffly re-built between 96 and 99 of them (sources vary on this) as a stopgap until a better, new armored car could be developed. The White-Laffly carried a short-barreled 37mm gun and a machine gun in a round two-man turret with the cannon pointed in one direction and the machine gun in the other; the turret had no established “front” and “rear” facing and could be pointed in either direction. Some vehicles had a second machine gun in an anti-aircraft mounting atop the turret. While it offered its four-man crew little armor protection and had no radio (a definite drawback for a reconnaissance vehicle), it did have good speed. Like many armored cars, it had two drivers, one facing in either direction. A handful of these armored cars served with the very short-lived 7th Division Légère Mécanique in June 1940, but most had been posted to the colonies and they saw action in Syria, Morocco and Tunisia. Pleased with the 50 AMD conversion, the French Army ordered more of them to an improved design. The White-Laffly 80 AMD had an 80 horsepower engine (thus the name) and the same scavenged armored body as the 50 AMD, but the additional power allowed it to carry a better-protected turret and develop slightly more speed. Main armament shifted to a 13.2mm Hotchkiss heavy machine gun pointed in one direction, and the standard 8mm version in the other. As with the 50 AMD, a second 8mm machine gun could be fitted in an anti-aircraft mounting. Like the earlier vehicle, the 80 AMD also lacked a radio in all but the platoon commander’s vehicle. Production stopped after 28 vehicles had been produced, as the very modern Panhard 178 had begun to arrive in cavalry units as well as fully-tracked armored “machine gun carriers” (that is, tanks). All 28 were shipped to North Africa, where they equipped one squadron in the 1st Foreign Legion Cavalry Regiment in Algeria and a second squadron in the 4th Chasseurs d’Afrique in Tunisia. They went into action against the Axis, and headlined the May 1943 victory parade in Tunis. Note: To spare players from having to squint and try to separate a tiny 5 from a tiny 8, the 50 AMD and 80 AMD playing pieces in La Campagne de Tunisie are called the “White” and “Laff80” respectively. Panhard had made components for armored cars during the Great War and afterwards, and in 1929 bid on a new contract for an armored car to be deployed in the colonies, particularly desert terrain. The Panhard prototype lost out to the White-Laffly, but the firm continued to refine its design and in 1932 won a small contract for a TOE vehicle (Théâtres d’Opérations Extérieurs, or Foreign Theaters of Operations). The Panhard 165AMD offered good speed, light-weight armored protection and good off-road performance. It carried the short-barreled 37mm gun common to French light tanks and armored cars and a machine gun. All 30 of those ordered went to North Africa, where the first of them saw action against Moroccan insurgents. That experience led to a modified version, the 175AMD, with a strengthened suspension and an added station for a rearward-facing driver. Another 30 of these were ordered, and they also went to North Africa. At least some of these apparently were modified to carry a 25mm anti-tank gun in place of the 37mm gun. Like other early French armored cars, only the platoon leader’s vehicle had a radio; company and battalion commanders had two radios, one to communicate with the platoon leaders and the other to contact high headquarters. A pair of Panhards, somewhere in North Africa. Note: The differences between the 165 and 175 models aren’t enough to show up in Panzer Grenadier terms, so both types are represented by the same playing piece. Another 30 of them were built as armored personnel carriers, the Panhard 179, with an armored section that could carry six infantrymen fitted in place of the fighting compartment. Like the armored cars, all of these went to North Africa as well. Though considered a successful vehicle, production ceased when Panhard began to build the Model 178 instead. Those are the armored cars; next we’ll look at the Army of Africa’s foreign mercenaries and Moroccan irregulars.